Uzbekistan with its numerous ancient monuments, rich nature, and the present-day rapid progress attracts the whole world's attention. Uzbekistan tourism sector has been rapidly growing over the past 10 years and today Uzbekistan is one of the most visited countries within the limits of the world-famous brand the "Great Silk Road". Uzbekistan tours are diverse, but historic and cultural heritage remains a base of the Uzbek tourist industry. For centuries the land of the present-day Uzbekistan was the junction and the centre of an ancient caravan road - the Great Silk Road, which stretched from the Mediterranean Sea to the Pacific Ocean. Along the routes of the Great Silk Road cities and towns sprang up, handicrafts developed, scientific schools and centers of philosophy and theology were formed. Many of the Silk Road cities managed to survive through the centuries and are ready to share their legends and magic of their beauty. Majestic and unique in their beauty are the palaces, madrassahs, mausoleums, and minarets of Samarkand, Bukhara, Khiva and Shakhrisabz; wrapped in mystery are the Buddhist temples and monasteries of Termez and Zoroastrian shrines of ancient Khorezm. Travelling in Uzbekistan tourists can both see the architectural gems of Uzbekistan and whenever possible take part in popular national and folk holidays of Uzbek people. (For example NAVRUZ- New Year festival of spring which falls on March 21st). Each itinerary includes a visit to a national house where tourists can learn about lifestyle of local people, taste the national Uzbek cuisine and enjoy the folklore show. 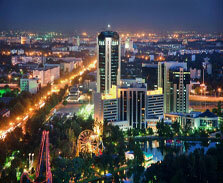 Uzbekistan is not only about history and fabled architecture. Enthusiasts of active tourism have always been very much attracted by Uzbekistan's exotic nature with its contrasts, diverse flora and fauna, sunny weather all the year round. The ambience of the legendary Silk Road of our distant past can be experienced during camel safari tours through the Kyzyl-Kum Desert. Sand-dunes, merciless sun, sparse islands of saxaul, camel's-thorn (alhagi) and sand, sand, sand… Unforgettable impressions of riding on camelback; watching the beautiful sunset, its colours bleeding into the horison's shimmering sands; overnight in yurtas (Kazakh collapsible tents); exotic national dishes and ceremonies – this is what makes this tour popular with tourists. The charm of Uzbekistan's unrivalled nature can be experienced during the trekking tours in the Western Tien-Shan, the Celestial mountains. In search of extreme adventures there come to Chimgan valley numerous mountaineers, avid to surmount the peak of the Big Chimgan, which is 3309 meters high (10850 feet). The romance of horseback ride tours appeal to people of any age and temperament. One of the most popular alluring horseback riding travels are through Ugham-Chatkal National Wild Park well-known for its rich flora and fauna. Uzbekistan is one of the best spots on our Earth for birdwatching activity. This is due to the wide variety of species (502) to be found here, as well as diversity of landscapes. Bird-watching tours are enchanting and offer a perfect combination of relaxation with a healthy mix of mental and physical exertion.The main ornithological itineraries include steppes and desert, lakes and mountains and numerous nature reserves. A two-week ornithological tour will always supply the enthusiast with hundreds of photos, video and sound recordings and will engrave in memories for years to come. Uzbekistan embraces unique diverse landscapes from sand-dunes of the deserts to blossoming oases, from riverside tugai woods to alpine meadows. No wonder its flora is incredibly diverse and includes many endemics. Everyone with a penchant for botany, whether a naturalist desiring to identify individual species or a passionate nature enthusiast inspired by the beauty and magic of flowers, will delight in flowerwatching tour in spectacular mountain landscape of the Western Tien-Shan. Mountains of the Western Tien-Shan offer everything a snow enthusiast could ask for. Comparatively mild climate, almost windless weather, availability of three hundred sunny days a year, big choice of skiable terrain with tracks for cross-country skiing, slalom and downhill runs, create good conditions for winter recreation. Over the last few years "Chimgan-Charvak-Beldersay" resort area has become a popular location for enthusiasts of heli-ski and free-ride, the youngest but fast developing types of extreme sports and recreation. Thus on the beautiful mountain slopes of Chimghan tract, located at the height of 1600 – 2400 meters above sea level, the blanket of snow lies from October till May and the local skiing routes meet the requirements of the International Mountain Skiing standards. 'Asian Switzerland' as Uzbekistan is sometimes called, is especially attractive for those who fancy extreme traveling, who become ecstatic about rafting down the rapid local rivers. Rafting along the rapid Chatkal River is the favorite activity of extreme travelers. They are interested in many-day rafting along the route rated as the route of the fifth category of complexity, as well as in diverse landscapes and natural obstacles. 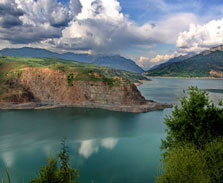 Uzbekistan's nature diversity, stunning landscapes and crystal-clear air attract many enthusiasts of ecological tourism. The most enthralling tour can be done on environmentally friendly means of transportation – a bicycle. Biking tours across the Ferghana Valley, as well as no less popular mountain biking along the trails of Ugam-Chatkal National Park in the spurs of the Western Tien-Shan, will leave you with unforgettable impressions. For all the flavours of its storied past, cultural mosaics and unique natural beauty, warmth, hospitality and enthusiasm of the people, Uzbekistan is the country to visit and marvel.